In many advanced economies, the ubiquity of the internet is now a given. It permeates commerce, social interactions, politics, culture and daily life. But this is not the case in all parts of the world. And while internet access continues to grow in poorer nations, there is still a long way to go before the world is completely wired. 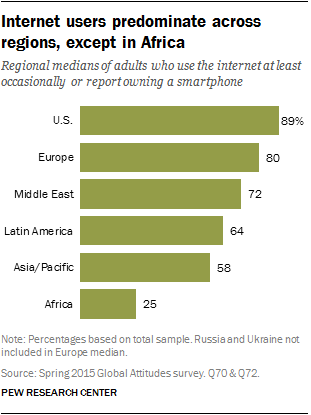 Across the 40 diverse countries surveyed in 2015, a median of 67% say that they either use the internet occasionally or own a smartphone (these respondents are automatically classified as internet users). The highest rates of access are in South Korea (94%), Australia (93%) and Canada (90%), but rates of over 80% also occur in the U.S., UK, Spain, Israel and Germany. Many large emerging economies have at least 60% of their population using the internet, including 72% in Russia and Turkey, 68% in Malaysia, 65% in China and 60% in Brazil. Overall, internet rates are lower in poorer countries, concentrated mostly in sub-Saharan Africa and parts of Asia, including 39% in Nigeria, 30% in Indonesia and 22% in India. The lowest access rates are found in some of the poorest countries surveyed, such as Burkina Faso (18%), Pakistan (15%), Uganda (11%) and Ethiopia (8%). Regionally, more people have access to the internet in North America and Europe compared with other parts of the world. Still, many people in the Middle East have internet access, including 86% in Israel, 72% in the Palestinian territories and 67% in Jordan. In Latin America, a median of 64% have access to the internet, with the highest rates in Chile (78%) and Argentina (71%) and the lowest rates in Mexico (54%) and Peru (52%). Asian-Pacific nations are quite varied in their internet access rates. As a result of the wide range of national incomes, the region includes the most wired nations in the survey (South Korea and Australia) along with some of the least wired (India and Pakistan). Many of the least economically developed nations surveyed are in sub-Saharan Africa, and consequently, only a quarter of the adult population across the nine African nations surveyed has internet access. 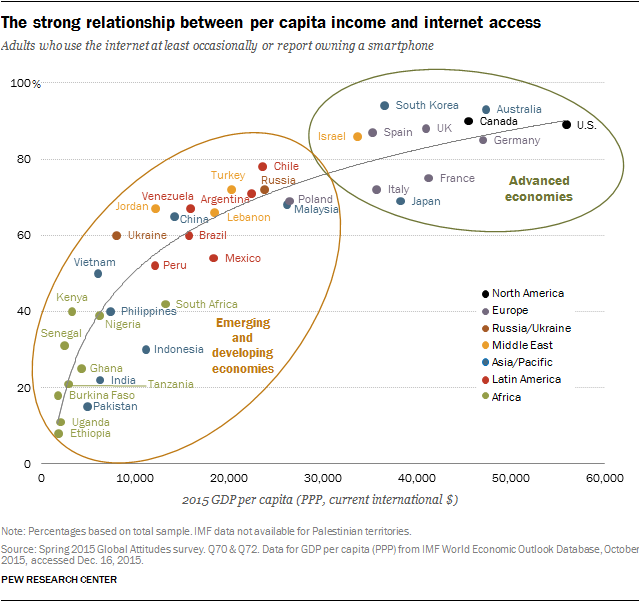 There is a strong correlation (0.87) between country wealth (as measured by per-capita gross domestic product on a purchasing power-adjusted basis) and internet access. Poorer nations, such as those in South and Southeast Asia and sub-Saharan Africa, have much lower internet rates compared with richer developing countries in Latin America and the Middle East, as well as rich nations in Europe, North America and East Asia and the Pacific. It should be noted that since most advanced economies in the survey have internet access rates of three-quarters or more, there does seem to be a base level of economic development at which national wealth no longer affects internet rates. For example, GDP per capita in South Korea is about $20,000 less, in adjusted terms, than GDP per capita in the U.S.; yet more South Koreans have access to the internet compared with Americans. In other words, as the internet becomes more ubiquitous worldwide, national wealth may no longer be the major driving force behind access. There have been rapid gains in reported internet access rates in a large number of emerging and developing nations surveyed since 2013. In 16 countries that were surveyed in both 2013 and 2015, there have been significant increases in the number of people who have access to the internet. The largest increase is in Turkey, where 72% now say that they use the internet at least occasionally or own a smartphone. That is up from 41% who said this in 2013. Double-digit gains are also seen in Jordan (+20), Malaysia (+19), Chile (+12), Brazil (+11) and China (+10), all of which are classified as emerging economies. Across all 40 countries surveyed, younger people (those ages 18-34) are more likely than older generations (35+) to say they use the internet or own a smartphone. The size of the gap varies by country, but the pattern is universal. The largest age gaps in internet access are found in emerging economies such as Vietnam (with a 56-percentage-point gap between 18- to 34-year-olds and those ages 35 and up), Ukraine (+49), China (+44), Poland (+42), Malaysia (+41), Indonesia (+40) and Turkey (+40). In essence, this means that internet access for the Millennial generation is nearing 100% in many of the world’s largest economies. However, in several other large emerging economies, such as India, Nigeria and South Africa, fewer than six-in-ten Millennials have access to the internet. While differences by age are not as stark in a number of rich countries, such as the U.S., the UK and Canada, there are still statistically significant age gaps on internet usage in all the advanced economies surveyed. In many of these countries, such as Italy, Spain, Germany, Australia and South Korea, virtually the entire Millennial generation is already online. A similar and also nearly universal pattern holds for differences in internet usage between more-educated and less-educated people. In all 37 countries where there are subsamples large enough to analyze, people with more education are more likely to have internet access than those with less education.4 This includes education gaps of 50 percentage points or more in Chile, Burkina Faso, Senegal, Peru, Lebanon, Jordan, Malaysia, Mexico, Kenya and Poland. 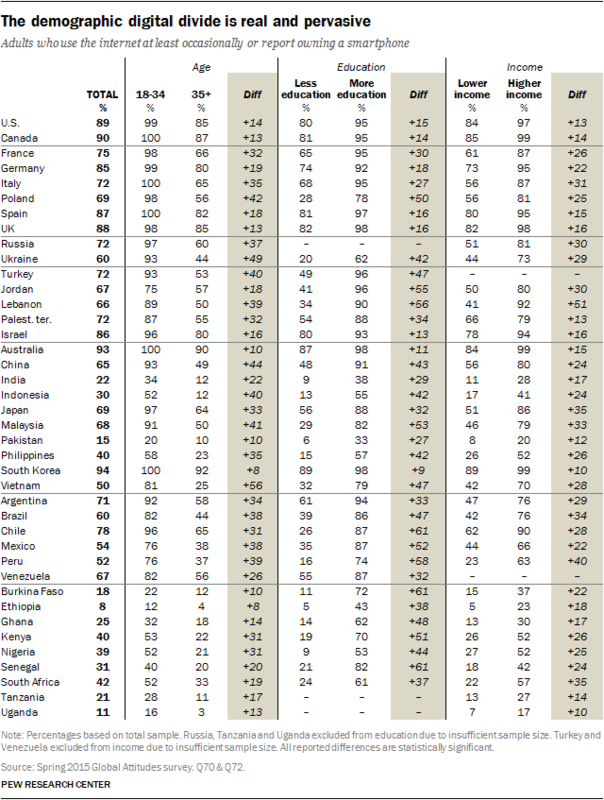 As with age, these gaps are much smaller in the advanced economies surveyed, but are still significant. Additionally, in all 38 countries surveyed with sufficient sample sizes for analysis, people with higher incomes are more likely to say that they use the internet occasionally or own a smartphone.5 These in-country gaps by income are less uniformly distributed across richer or poorer nations. For example, the largest income gaps occur in a diverse set of countries including Lebanon (51-point gap between higher and lower income), Peru (+40), Japan (+35), South Africa (+35), Brazil (+34), Malaysia (+33), Italy (+30), Russia (+30) and Jordan (+30). While gender is less determinative than youth, education and income in whether someone has internet access, there are significant gender gaps in half of the countries surveyed. 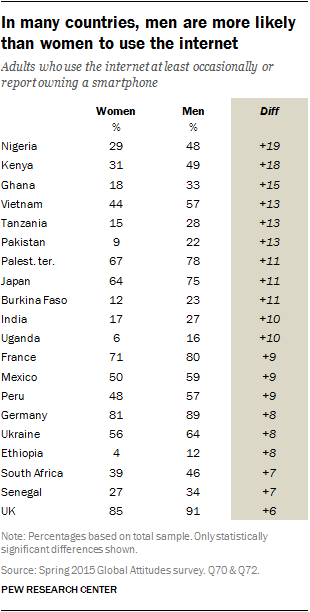 The gender divide appears in all of the sub-Saharan African nations surveyed. The largest gap among all countries surveyed occurs in Nigeria, where 48% of men say they use the internet versus only 29% of women. Double-digit gender gaps also appear in Kenya, Ghana, Vietnam, Tanzania, Pakistan, the Palestinian territories, Japan, Burkina Faso, India and Uganda. But there are also statistically significant gender differences on internet access in prominent European nations, such as France, Germany and the UK. Once online, people around the world are frequent internet users. And while daily use is more common within advanced economies, a majority of internet users in 34 of the 40 countries surveyed say they use the internet at least once a day. The most frequent users – those who say that they access the internet “several times a day” – are mainly concentrated in advanced economies, with a few notable exceptions. Seven-in-ten or more of internet users in Australia (77%), Lebanon (70%), Canada (70%) and Italy (70%) say they use the internet several times a day. Similar percentages of internet users also say this in Israel, the U.S., UK, Chile and Japan. Despite South Korea being the country with the highest levels of internet access in the survey, only 58% say they utilize the internet more than once a day. This is more similar to the behavior of online Argentines, Nigerians, Brazilians and Chinese – all of whose countries see access rates far lower than that of South Korea. At the lower end of daily internet usage are some of the countries with lower overall levels of internet access, including many sub-Saharan African and South and Southeast Asian nations. Still, even among internet users in these countries, at least four-in-ten choose to access it daily. As with overall internet rates, there has been an increase in the share of internet users who report use several times a day in many of these countries since 2014. For example, in 2014 only 38% of Nigerian internet users said they access the internet several times a day. In 2015, that number jumped to 58%. Similarly, in China, the percentage of internet users who say they use it daily increased from 45% in 2014 to 58% in 2015. Overall, there were significant increases in internet use multiple times a day among online adults in 12 emerging and developing nations polled in both 2014 and 2015. Demographically speaking, a similar pattern holds true for the most frequent internet users among online adults in advanced economies as it does for overall internet access. Online Millennials, more-educated adults and those with higher incomes are more likely to use the internet more than once a day. In other words, age, education and income play a role not just in overall internet access, but also in the amount of time spent online.